More Austrian adventures both in cooking and the weather, plus a continuing look at the history of Catholic Social Teaching and the Worker Priest. Drop me an e-mail or leave a comment if the Catholic:Under The Hood t-shirt sounds good to you. Send e-mail questions and comments to catholicunderthehood@gmail.com or leave voicemail at 1 740 936 4354. This entry was written by sbeshonertor, posted on September 8, 2007 at 10:06 am, filed under Catholic Social Teaching, History, Podcast. Bookmark the permalink. Follow any comments here with the RSS feed for this post. Post a comment or leave a trackback: Trackback URL. Enjoyed the stories about getting settled in Austria. We lived in southern Germany in ’04 and had similar shopping experiences during the first weeks. During your trip to Muenchen try to visit Andechs am Dom, a small restaurant near the Frauenkirche. No Guiness there but a very good, quite strong beer called “Doppelbock Dunkel.” It is brewed at a Benedictine Monastery in southern Bavaria. Loved your new show. I just got from Irondoale AL to Vienna, to visit my family and friends. You can fry your Leberkäse in a frying pan, eat it cold or rost in the oven. Traditionally you would eat it with (Iglo Creme Spinat) spinach or vegetables. I feel your pain vis-a-vis the shopping – I lived in southern Germany as a child and still have slight disinclinations about LeberKaese. However, if you’re feeling adventerous in your cooking (and – does Leberkaese go bad? 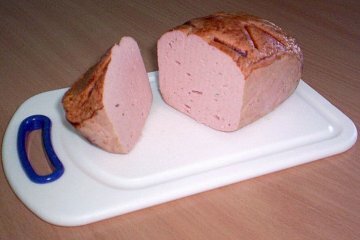 ), and decide to try Leberkaese, I’d suggest it prepared similar to this way: http://www.recipezaar.com/110373. I’ve been in Wienn and I taste Leberkase and Pferdleberkase . Two seem quite the same. What’s the difference ? And I ask why this is not so popular as hamburger or hot dog ? I haven’t have Pferdleberkase, though it sounds as if it may be made out of different types of meat or milk. As for why it’s not as popular, I think that has to do with the relative unpopularity of liver in the US.